Rick L. Najera is an award-winning actor-writer-director-producer with credits in film, television, theatre and Broadway. Honored twice by Hispanic Business Magazine as one of the “100 Most Influential Latinos in America.” Najera is one of the most powerful voices in the Latino world today. 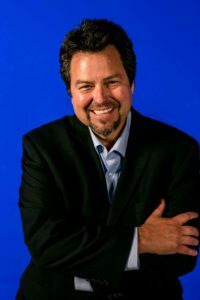 With an extensive range of talent, Najera has enjoyed working in many forms of entertainment, whether writing for television or film to acting and theatrical stage performance. He has starred and guest starred in numerous TV shows and films and developed original sketch comedy for TV, stage and Internet. Najera penned the holiday feature film Nothing Like the Holidays, starring Debra Messing, Alfred Molina and John Leguizamo, which won him a prestigious ALMA Award. He was also honored with two WGA nominations for his writing on MAD TV. His writing/acting credits also include the critically acclaimed, award-winning stage works, Latinologues (Broadway), directed by Cheech Marin; an interactive, musical comedy Sweet 15-Quinceañera; and Diary of a Dad Man, which premiered on Showtime in January 2011 as a half-hour comedy special that he wrote, executive produced and starred in. His next comedy, Legally Brown, also aired on Showtime in 2011. Najera has also written for groundbreaking television comedies such as MAD TV, In Living Color, and Culture Clash. 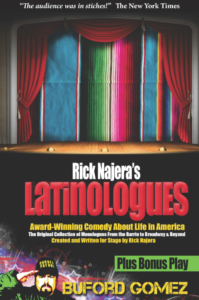 As one of only three Latinos in history to write and star in his own show on Broadway, Najera made his Broadway debut in 2005 with his self-written and created, award-winning sketch comedy show, Latinologues. The show triumphed on Broadway at the historic Helen Hayes Theatre on W. 44th Street for a four-month run (137 performances with an extension), a historical achievement for a Latino-oriented show. Najera’s show on Broadway paved the way for other acts to follow such as Tony Award winning, In The Heights. With a more than 15 year history of performances, Latinologues is the longest running and only showcase of its kind for Latinos in America, and Najera has mentored and directed more than 150 actors in the show. Najera’s other works include, Latins Anonymous, A Peculiar People, A Quiet Love, and The Pain of the Macho.